Grew Up… around the U.S. Since their mother works as a lounge singer, Zack and Cody have been on the move since childhood. Living... at the Tipton Hotel. It's not a conventional living situation, but since it's the place where their mother has her latest gig, it's where they're staying. Although Zack is sure at first that it's "the most boring hotel, in the history of boring hotels," it's not long before he finds out how wrong that is. Profession… student, though not a very good one. While his brother Cody is a straight-A student, Zack is more prone to get straight Ds. The only exception is woodshop, where Zack is – for once – top of the class. Interests… sports, girls, and generally having fun. He might not get very good grades, but Zack's acing the one subject that really matters when you're 12: coolness. Relationship Status… constantly changing. Zack might only be in middle school, but he's already got a reputation for being a player. After all, who can't resist a man with "jellybeans, cherry sodas and cheese product in a can," aka "all the ingredients of romance"? Challenge… keeping himself entertained. Then again, it’s not really much of a “challenge” for him – Zack’s a natural at enjoying himself. The Tipton attracts all sorts of guests, and between the famous guests and the eccentric staff, there's plenty of opportunities for a boisterous kid like Zack to get into trouble. Personality… immature, impulsive, and carefree. While Cody is stressing over math tests and someday getting into M.I.T., Zack's more likely to be found playing video games and hitting on Maddie, the Tipton's candy counter girl. But for all that Zack mocks his brother for being a dork, the two make a good team, as Zack's schemes show again and again. Zack Martin's popularity ranking on CharacTour is #4148 out of 5,000+ characters. See our top-ranked characters and read their profiles. The Suite Life of Zack & Cody is an American sitcom created by Danny Kallis and Jim Geoghan. The series was first broadcast on Disney Channel on March 18, 2005, with 4 million viewers, making it the most successful premiere for Disney Channel in 2005. It was one of their first five shows available on the iTunes Store. The series was nominated for an Emmy Award three times and was nominated for a Nickelodeon Kids' Choice Award three times. The show was also a long-standing staple of the now defunct ABC Kids Saturday morning block on ABC. The series is set in the Tipton Hotel in Boston and centers on Zack and Cody Martin, troublesome twins who live at the Tipton Hotel. The series' other main characters include Tipton hotel's ditzy heiress London Tipton, the hotel's candy counter girl Maddie Fitzpatrick, the hotel's manager, Mr. Moseby, and the boys' single mother and one of the hotel's nightclub performers, Carey. The series is the third Disney Channel Original to have more than 65 episodes, after That's So Raven and Kim Possible. Reruns air on Disney XD. The Suite Life spawned a spinoff series, also starring the Sprouse twins, called The Suite Life on Deck, which aired on the Disney Channel from 2008 to 2011. 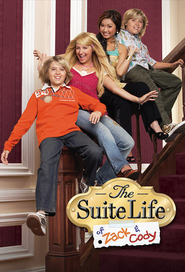 A TV movie based on both series, The Suite Life Movie, aired on Disney in 2011.